By Anthony Melella Until recently, I had never seen a Kevin Smith film. No, I've no idea how that happened either. That's the exact same response as I've had from everyone. It was almost as if it was just expected that everyone had seen these films. I was discussing films with a friend recently, and the subject of those by Kevin Smith had come up. I declared I was a Kevin Smith virgin, and the blood seemed to drain from her face as if I had crapped over Star Wars or Star Trek at Comic-Con. Consequently, I went out of my way to bring his films up to other friends. The response was always the same. The conclusion was that I was in the minority in neglecting to view these masterpieces, and I should correct that mistake right away. So the Kevin Smith marathon began. 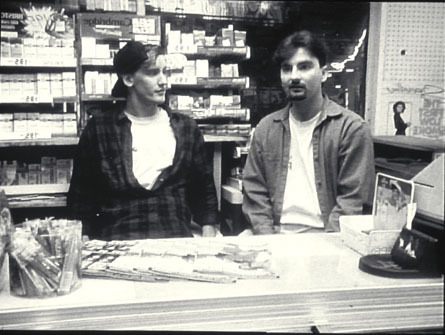 In particular, the 'View Askewniverse' series of films which I was advised in going through, starting with Clerks. I'm going to presume that you have watched at least most of these (seems like it from everyone i've been speaking to), so i'm not going to go into a detailed review of each film. Plenty of people and sites out there have already done that. Instead, i'm just going to spend the next few paragraphs giving my initial thoughts on entering the world of Kevin Smith for the first time. After the amount of hype I was exposed to in a short amount of time, there was always a chance that it would not quite live up to it. I'm happy to report that, for the most part, it does. Clerks is possibly the film I can relate to the most. Both the two main leads (Dante and Randal) have no love for where they work. They seem to get by each day with each others company to entertain them, using their customers as discussion points. It's something I can certainly relate to, working in retail myself. What I love about the characters is something which comes up time and time again with Smith's later films. You have two friends, one of which is 'normal' while the other plays crazy ideas and theories off him. It certainly helps with the films key asset - it's dialogue. If there was one key thing I picked up from all the films I watched, it was that Kevin Smith is a master at writing dialogue. The interaction between the main characters is what helps drive the films forward, and there are plenty of examples in the next film in the series - Mallrats. The interaction between the two main characters here (Brodie and TS) was the highlight of the movie. The setup of the film itself felt a little more like a teen comedy, which turned me off a little bit, with a lot more visual comedy rather than the brilliant dialogue humour in Clerks. You had the guy who couldn't see the magic eye painting while everyone else could, some joke about smearing poo on someones hand and then they go and put it in their mouth...you get the idea. Just seems a bit too much like they are trying to force the laugh out. It also ends in the same way that all these sort of films end, which left me a little disappointed. Next on the list was Chasing Amy. What I enjoyed about this one was the fact that even though it dealt with a subject done thousands of times before (guy tries to get girl to love him), it does it in a way I hadn't seen before. Holden is madly in love with lesbian Alyssa, and is trying to win her over. Not only is he having to deal with the usual issues, but he also has to change her sexual preference. It also gets interesting in the middle where he discovers her past, and it becomes her trying to explain herself to him. Plenty of strong scenes between the pair (the one with them both sitting in the car is a particular highlight) keep you interested in how it ends up, and it's a refreshing change to see how the film concludes. Certainly different from your usual Hollywood film. Talking of different, we move onto Dogma. This was possibly my least favourite of the films, due to it being a little long. It was still enjoyable, but the pacing in parts was a little slow. The best scenes for me were the ones with Bartleby and Loki (played by Affleck and Damon) judging others. They work well when on the same scene together, and it continues the trend of having a duo bounce off each other. The rest of the casting play their roles as well as they need to be, but some of the action does seem a little over the top. I understand that's how it's supposed to be, but I don't think it works as well because of it. I'm also not too keen on the character of Bethany Sloane. Nothing against the actress (Linda Fiorentino) that plays her, but I wasn't able to connect with her character and therefore just didn't get on with her impact on the film. So, the worst of the bunch I watched, but still enjoyable enough to watch at least once. The next film in the series would have been Jay and Silent Bob Strike Back. However, as of writing this, I have not managed to see it. I will though, for I am a completest. Speaking of those two characters, I do like how they seem to show up in every film. Sometimes it can be a small cameo, such as their appearance in Chasing Amy. Sometimes they take the role of two of the leads in the movie, such as in Dogma. However they're used, it always seems to make a positive impact on the film. You almost want to cheer when they enter the scene for the first time. Jason Mewes does a fantastic job playing Jay, the guy who just won't shut up and Kevin Smith does equally as good a job playing Silent Bob. Despite him not having lines, his facial reactions mean that you know what he is trying to say. Reminds me a little bit of Gromit from Wallace and Gromit. What makes it even better is that when Silent Bob does talk, it's normally brilliant stuff. Whether it be his story in Chasing Amy, or just the few words uttered in Dogma, it's always well received. Last on the list is Clerks II. After being fully impressed by the first film, I went in doubting that it could match the original. I'm happy to report that it just about manages it. The change in setting is clever as it helps keep things fresh, as is the love triangle that Dante is involved in. The humour is provided as always by Randal and he is given the super nerd Elias to play with. Some of the best scenes from the film come from the interaction between the two of them. An example of this in action is the debate of Star Wars vs Lord of the Rings (including a cameo appearance from Kevin Weisman) which is brilliantly done. Maybe it's because the references are now more current due to it being the most recent film. Discussions of the Transformers film, internet forums, Lord of the Rings etc, helps keep the film feeling relevant for now. Apart from that, it's the usual interaction between the two leads that keep you in familiar territory and it's nice to see it go full circle at the end, even if it's expected. So then, what's my overall opinion now that i've seen 5 of Kevin Smith's films. He's certainly a very talented writer, particularly in dialogue and interaction between characters. I will also admit that I am now a fan of the Clerks universe, mainly because of the leads in those two films. The reason I probably didn't get on as much with Dogma, is that it felt a little too Hollywood and over the top. I really liked the simplistic nature of the Clerks films and, to a certain extent, Mallrats and Chasing Amy. However, I fully recommend seeing them all. Did I mention I really liked Clerks?